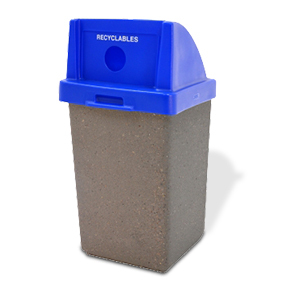 This 30 gallon concrete recycling receptacle is fully equipped to handle high volume traffic even while in the most extreme weather conditions. Recycling sign and matching lid is a highly visible way to promote recycling participation, enjoy clean spaces and elevate community pride. The polyethylene push-door lid shields contents, reduces odors and prevents unwanted pests it also features a molded in handle for easy maintenance. A security cable ensures that the lid is always secured to the receptacle—providing a substantial deterrent and also very helpful for maintenance. The base of this outdoor receptacle has an excellent feature especially for high precipitation areas, the aptly named 1-1/4" drain hole. This commercial grade recycler is constructed by ASTM compliant, steel rebar reinforced, precast concrete. Choose from a variety of colors and finishes to complement any facility. Liner sold separately.